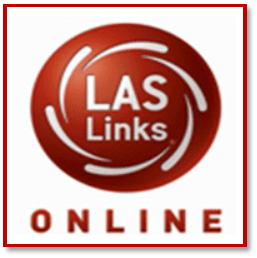 LAS Links is an integrated suite of English language proficiency assessments and instructional tools designed to strengthen your English language learning (ELL) program. Use LAS Links to accurately and quickly place students into the appropriate bilingual and ELL programs, where they can make progress and better enjoy the learning process. LAS Links also helps you monitor progress, develop optimal instruction plans, and determine when students are ready to exit the program and meet Title III reporting requirements. Move your ELL students ahead quickly in the classroom - and in the world - with LAS Links. please contact DRC at 800.538.9547 or LASLinksHelpdesk@datarecognitioncorp.com. LAS Links Products: Click on one of these icons to access product information and order forms. The new LAS Links Forms and placement tests correspond to the goals and objectives of states' rigorous content standards in language arts, mathematics, and science. For initial placement of students, LAS Links provides the option of using a short placement test or a full form that provides scale scores and proficiency levels. For more information or assistance in placing your order, contact ACSI Member Care or call 800.367.0798. Order forms are available upon request.